The brown water snake is semi aquatic in its nature and there are a number of names that are used to refer to it. It is sometimes called the southern water snake, the water rattle, the water rattler, pied water snake, aspic, false moccasin, great water snake or water pilot amongst many other names. Its scientific name is Nerodia Tqaxispilota. It has a bulky body with a thin neck in comparison to the head. The snake has got a color that is rusty brown or brown. It has some 25 coloured botches on the back. These are spots which are also present at the belly side and they run starting from the eyes all the way to the jaw. The color of the snakes belly can vary. It can be either brown to yellow and there are black crescents and some brown splotches too. The snake measures around 30-60 inches and the longest ever recorded snake was around 70 inches. The males are much lighter and smaller in comparison to the females. The nostrils and the eyes are placed at the head top in a way that the snake is cap[able of breathing and seeing by simply having a small part of the head over the water level while the body remains submerged. The neck which is thin and broad face gives this snake a kind of diamond headed appearance. The snake also has some 25-33 row of dorsal scales at the mid part of its body. This snake lives within water and it can also come to land and stay near the water. These are snakes that you can find in rivers and streams around Florida, south Virginia and California. The snakes are also located in the coastal plains in Georgina. They are also very common in flowing waters and this includes the canals, and creeks. Their habitat is usually well surrounded by vegetation that overhangs, emergent snags and Rocky River banks. These snakes are also quite common in the bottomland forests, the saw grass prairies, tidal marshes and hardwood hammocks. Find out: Where should I relocate a trapped snake? The brown water snakes are usually active in the day and also the night. They can be found as they bask on the tree branches which are over flowing water. If they are not hunting, they will spend the day in trees. In this way, they can be able to dive into the water and swim away in case they are faced by any danger. You can spot many snakes basking together. They eat fish, earthworms, rodents and frogs. 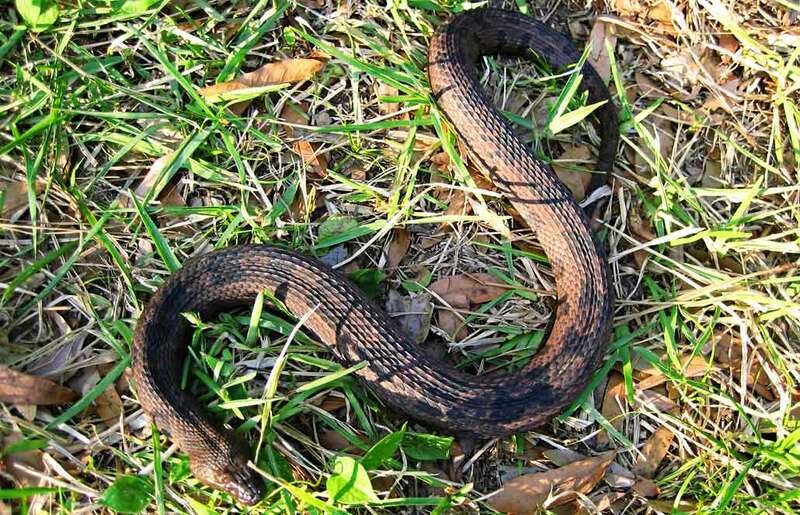 Go back to the main Snake Removal page for more information about The Brown Water Snake.